We’d love your help. Let us know what’s wrong with this preview of The Lamb's Supper by Scott Hahn. To ask other readers questions about The Lamb's Supper, please sign up. any chance of an ebook version of this book? Cweb Well it's not listed at Amazon after 2 years still. Scott Hahn’s book, The Lamb’s Supper is an excellent eschatological explanation of the Roman Catholic Mass. In 2011, it served as background for a couple of classes I was then teaching. In preparation for the implementation of the Third Edition of the Roman Missal our parish used A Biblical Walk Through the Mass (Book): Understanding What We Say and Do In The Liturgy to prepare and I read this book to gain a fuller appreciation of the Eucharist. Hahn's work is based on the Mass as expression of H Scott Hahn’s book, The Lamb’s Supper is an excellent eschatological explanation of the Roman Catholic Mass. In 2011, it served as background for a couple of classes I was then teaching. In preparation for the implementation of the Third Edition of the Roman Missal our parish used A Biblical Walk Through the Mass (Book): Understanding What We Say and Do In The Liturgy to prepare and I read this book to gain a fuller appreciation of the Eucharist. One of the best religion books that I've read this year. Told in a simple and direct prose, Scott Hahn's main points here are that the last book of the Holy Bible, The Book of Revelation is actually describing the Holy Mass by the Roman Catholics and that the Holy Mass is actually a taste of heaven here on earth. The title comes from the fact that the Jesus' passion and crucifixion in the New Testament is actually foreshadowed by Abraham about to sacrifice his son Isaac in the Old Testament. Dur One of the best religion books that I've read this year. Told in a simple and direct prose, Scott Hahn's main points here are that the last book of the Holy Bible, The Book of Revelation is actually describing the Holy Mass by the Roman Catholics and that the Holy Mass is actually a taste of heaven here on earth. The title comes from the fact that the Jesus' passion and crucifixion in the New Testament is actually foreshadowed by Abraham about to sacrifice his son Isaac in the Old Testament. During that time, lambs were God the Father's preferred animal as offering to Him. That's the reason why Jesus is also called the Lamb of God. Are you a practicing Catholic and you sometimes feel that the Sunday mass is becoming monotonous or boring? Do you complain that the sound system is bad so you cannot hear what the priest is saying? Or the priest has a low IQ and that shows in his meaningless and pointless homily? Do you find the people in the church with the children roaming around and shouting and sometimes crying while you are trying to pray distracting? Do you feel that the gospel is something that you've heard and probably read a hundred of times that they are no longer exciting to hear? Do you wonder what are the meanings of those phrases and words that they say during the mass? If your answer is Yes to any of these, then this book is for you. Scott Hahn used to be a Calvinist and the first time he attended the Catholic Mass, he got so interested that he researched on it and wrote this book. What is it with these converts that they make good books and better evangelists if not believers? It's because they know something about their former religions so when they delve into Catholicism they bring with them their knowledge. The effect is that they are more convincing as their listeners or followers learn some new things about their former religions. Also, they tend to thirst more about Catholic religion than non-converts so they try to discover the teachings, read more books, talk to more cardinals, bishops, priests and other men of God. They also want to prove themselves that the community that accepted them will find them worthy. So, they prove and try to assert that they are part of the flock. I hope they will just continue and not start and become flash-in-the-pan. This book was one of the essentials in my conversion to the Catholic Faith. All of the sudden I knew what worship was to look like after being raised Southern Baptist and passing through other Protestant churches. Wow. There's so much great information in this book, and it's written in such an easy way. I mean, after reading some of the Pope Benedict XVI's books, this -- I could get used to. And strangely enough it is consoling. It's not really relevant to the situation that I'm currently bothered by, but when he explains the book of Revelation, you get the distinct feeling that God has a plan that can't fail. The latter part was a bit frustrating in that it seemed many concepts were introduced but only to Wow. There's so much great information in this book, and it's written in such an easy way. I mean, after reading some of the Pope Benedict XVI's books, this -- I could get used to. The latter part was a bit frustrating in that it seemed many concepts were introduced but only too briefly without going into the depth. Maybe it was my fault, reading too quickly or something. But it seemed like Scott Hahn was using key phrases that I would want to pause at and consider, but then he'd throw out the next semi-related sentence. The final part of the book is where everything is kind of summarized and I liked it a lot. I wanted to quote a lot from that section, but I can't quote whole chapters! And besides you kind of need to know what goes before to "get it", get all the meaning from it. Reason for Reading: I love Scott Hahn's writings and plan to read as much of his work as possible. This is his most popular book so I decided to read it next. This book has both a Nihil Obstat and Imprimatur, something that is always important to me when reading Catholic non-fiction. Going back to the early Christian's for inspiration Hahn shows us how they used the Book of Revelation to understand the Mass. The two are connected to such an amazing degree that Hahn's easy to read lay person voice Reason for Reading: I love Scott Hahn's writings and plan to read as much of his work as possible. This is his most popular book so I decided to read it next. This book has both a Nihil Obstat and Imprimatur, something that is always important to me when reading Catholic non-fiction. Going back to the early Christian's for inspiration Hahn shows us how they used the Book of Revelation to understand the Mass. The two are connected to such an amazing degree that Hahn's easy to read lay person voice makes everything he explains abundantly clear. Hahn uses a heavy foundation of Old Testament scripture and explains thoroughly the need for sacrifice in the OT Jewish religion. This increasingly sheds light on Jesus' role as "lamb" in the New Testament, in Revelation and in the Mass. Hahn shows how Revelation is divided into two parts at Chapter 11 equalling the Liturgy of the Word and the Liturgy of the Eucharist. When "we lift up our hearts" we literally are lifting them up to heaven and the Mass is the one place and time that we experience Heaven on earth. Well, I suppose I have a unique perspective on this book. I was raised Catholic. Never missed a Sunday. My childhood was filled with going to Mass. At 20 years old I joined a Non-Denominational church and went into the full time ministry, now 26 years ago. I have since received a Masters Degree in Bible and run five Ministry Training Academies. I am now going back to school at the Oblate School of Theology, a Catholic graduate school, to receive my PhD in Spirituality. That being said, I know Ca Well, I suppose I have a unique perspective on this book. I was raised Catholic. Never missed a Sunday. My childhood was filled with going to Mass. At 20 years old I joined a Non-Denominational church and went into the full time ministry, now 26 years ago. I have since received a Masters Degree in Bible and run five Ministry Training Academies. I am now going back to school at the Oblate School of Theology, a Catholic graduate school, to receive my PhD in Spirituality. That being said, I know Catholicism and have a lot of respect for it, and I know the Bible well. I teach Biblical Interpretation in our academies. I share all of this to give context to my review of the book. The Lamb's Supper is a topical study of the Catholic Mass, comparing it to the book of Revelation. It is interesting in the fact that it is written by a Catholic theologian who converted from a Protestant background. He writes enthusiastically about his discovered excitement regarding the Mass. His enthusiasm is clear throughout the book. First the good. I learned so much about the Catholic faith and the reasoning behind so much of the Mass. I wish I knew a fraction of this as a child. It would have given some meaning to my mundane Sunday existence as a young Catholic. I really came to respect the purpose of a liturgy. I now appreciate the repetition and prayers. I understand the great emphasis Catholics put on the Eucharist. Even though I disagree with some of the reasoning and conclusions, it gave me a deeper respect for the Mass. In the non-denominational world, we have swung the pendulum so far away from liturgy and the rituals of communion that it has made it un-special. At least in my experience. It is too bad that we cannot find a healthy biblical middle ground. My criticism of this book is sharp. Unfortunately Hahn's passion leads him to bad exegesis and proof-texting. Proof-texting is the grand-daddy of "no-no's" in Biblical exegesis. It is when you get some excited to prove your point that you take scripture out of context to mean things it doesn't. Hahn is guilty throughout The Lamb's Supper. He uses the Bible to establish his reasoning for many points but ignores it over and over again when it doesn't back him up. He makes huge leaps and generalizations. Honestly, his misuse of the Bible discredits him. Unfortunately, to a more Biblically illiterate audience, his quoting of verses and sheer peppering of them throughout the book makes him look like a Bible scholar. For someone who knows their Bible and checks his references, it's quite appalling how he stretches scripture to make his point. I would have advised Hahn to use the scripture where appropriate but just state the value of Catholic tradition when the Bible doesn't really apply. Just say it! "This is why, as Catholics, we _______!" Tradition has its place and is valuable. We all have them. We just have to be careful not to try to justify our traditions if they aren't in the Bible! But, I wasn't consulted 😝. And so, I can be honest in my review. This book definitely changed how I look at the Apocalypse (I so greatly prefer that name to Revelation), as well as giving me more inspiration during Mass. I'm glad I finally tracked it down, or rather, my dad did and lent it to me at Easter. Scott references it frequently in his talks, and it's no surprise why. I gave the book four stars instead of five due to its somewhat disorganized structure and its absurdly colloquial language. There's making your book accessible, at which Scott Hahn admitt This book definitely changed how I look at the Apocalypse (I so greatly prefer that name to Revelation), as well as giving me more inspiration during Mass. I'm glad I finally tracked it down, or rather, my dad did and lent it to me at Easter. Scott references it frequently in his talks, and it's no surprise why. I gave the book four stars instead of five due to its somewhat disorganized structure and its absurdly colloquial language. There's making your book accessible, at which Scott Hahn admittedly excels in general; then there's loading your book down with section headings that are pop culture groaners like "Todah Recall". Meanwhile, if your point is that the Mass, especially its structure, is reflected in and reflects the Apocalypse, especially in its structure, can't we/shouldn't we stick more closely to the structure of the book and tackle it in order? I'm not a stickler for organization, and I searched for some sort of purpose in the way this book was laid out, but I didn't find it. Still, overall, this is an intriguing book, and you won't find this content just anywhere. It's short and well worth the time of anyone with an interest in the New Testament. A Missa é o ponto onde Céu e Terra se encontram. O livro do Apocalipse é a chave para entender a liturgia, e esta para entender aquele. Escritura e liturgia foram feitas uma para a outra. A Palavra precede o Sacrifício. "E olhei: e vi no meio do Trono, e dos quatro animais, e no meio dos Anciãos, um Cordeiro como morto, que estava de pé, o qual tinha sete cornos, e sete olhos, que são os sete espíritos de Deus mandados por toda a terra. (...) Digno é o Cordeiro, que foi morto, de receber a virtud A Missa é o ponto onde Céu e Terra se encontram. O livro do Apocalipse é a chave para entender a liturgia, e esta para entender aquele. Escritura e liturgia foram feitas uma para a outra. A Palavra precede o Sacrifício. I wanted to give this book 2.5 stars, but can't, and sadly don't think I can round up for it. First and foremost, I am not a Catholic. That being said, I did all I could to read this book without any bias. I wanted to gain a better understanding of the Catholic approach to the Eucharist, and believe that the Catholics are very reverent about it despite some of the differences I have with their beliefs. I was disappointed when it didn't seem like it focused as much on the Eucharist as much as it d I wanted to give this book 2.5 stars, but can't, and sadly don't think I can round up for it. First and foremost, I am not a Catholic. That being said, I did all I could to read this book without any bias. I wanted to gain a better understanding of the Catholic approach to the Eucharist, and believe that the Catholics are very reverent about it despite some of the differences I have with their beliefs. I was disappointed when it didn't seem like it focused as much on the Eucharist as much as it did Catholic Mass in general, and even then it didn't seem to have much about that considering the book's purpose is to explain how Mass is a time when heaven and earth meet. Hahn claims that growing up Protestant, and even as a minister, he never understood the book of Revelation, and I can understand why given the typical "Left Behind" style teaching he would have received. He claims that being a part of the Catholic church helped him to finally understand the book of Revelation, but I really don't believe it. Why is that? Because he gives the book just as many meanings, and confusing meanings, as he claims he left behind. He states that the book of Revelation is about the Mass, but then he spends a large portion of the explanation of Revelation explaining how it is actually a statement about the destruction of Jerusalem...even though he also states that it was looking back to the destruction of Jerusalem. He seems to flip flop back and forth. On top of that, he claims that all of these other teachings about Revelation are probably true as well because the book can have many meanings, so while he talks about how confusing the book of Revelation was when taught in the Protestant styles, he also says that they are most likely true as well as here. It doens't make sense. Hahn seems to do a lot of interpretation based on what he already believes due to what the Catholic church teaches as well. It isn't about studying the book of Revelation, discerning what it means and then shaping his beliefs on that, but rather, "The Catholic church teaches this, and so this has to match up with this because Catholicism teaches is true." For instances, the 144,000 in Revelation have to represent the priesthood since they are virgins. There are some things he just gets wrong as well. For instance, he says that God destroys Sodom because it was standing in the way of the covenant God made with Abraham. Where does the Bible say that? Nowhere. Ezekiel gives us reasons why they were destroyed and that isn't it. He also makes the claim that Jericho was destroyed because it tried to get between God and His promises to Israel. This simply isn't true. Israel approached Jericho, not the other way around. They sent spies there, and they marched around the walls without Jericho ever striking them or trying to stop them. This book, I suppose, just wasn't what I expected, but it isn't getting 2 stars simply because I don't agree with Catholic doctrine, but because it does a poor job of explaining what Hahn is trying to teach with any sort of consistent, understandable way. He gets a number of things just wrong, and they are simple things. He doesn't try to interpret the book based on what it says, but rather on what he already believes. Even though this book is fairly short, it is very hard to sum up. Don't be fooled by this books size, this is one of the most profound books on Catholic theology you will ever read. It might even be the most profound. The profoundness does not lie in dense verbage, this book is very easy to read and understand. It's profound nature lies in the incredible thoughts and insights into the mass. The basic thesis is that the Mass is haven on earth, and that the book of Revelation shows this. In every s Even though this book is fairly short, it is very hard to sum up. Don't be fooled by this books size, this is one of the most profound books on Catholic theology you will ever read. It might even be the most profound. The profoundness does not lie in dense verbage, this book is very easy to read and understand. It's profound nature lies in the incredible thoughts and insights into the mass. The basic thesis is that the Mass is haven on earth, and that the book of Revelation shows this. In every single Mass, we participate in the heavenly liturgy. This is not a novel idea. The book of Revelation itself is a commentary on this, along with the Church fathers, and the authoritative texts of Vatican II. A lot of the background for this book was covered in the last few chapters of Scott Hahn's other book, A Father who keeps his promises, where he deals with the Eucharist-Passover offering and his sacrifice on the cross as one single sacrifice. The first part of the book serves as a long introduction, recapping that, the history of the Mass, and giving a brief explanation of some of its more important parts. In dealing with the prickly book of revelation issues, such as if the book should be read Futuristic, Historically, Idealistic, or Preteristic, he thinks all four view points have a share in the book, but Preterism is the strongest, as the book deals a lot with the fall of Jerusalem in AD 70. In the second part of the book, Hahn gives a great explanation of a lot of the more confusing aspects of Revelation, such as the beasts and numbers. He does a wonderful job of making the book come alive. Scott Hahn makes his real case in the third section of the book, relating all of it to mass. This section of the book is some of the most important Catholic theological reading one could do. It gives you a totally different perspective on the mass. Another very good treatment on a deep theological topic by Dr. Hahn. This book is a real deep-dive into the Mass and it's origins. It's not so much an academic treatment of the subject as it is a brief overview, enough to give someone a good idea of the further reading they'd need to do if they were interested in a specific topic. Dr. Hahn has excellent insights, drawn primarily from the church fathers and the book of Revelation, about the theology, practice, and historical significance of the M Another very good treatment on a deep theological topic by Dr. Hahn. This book is a real deep-dive into the Mass and it's origins. It's not so much an academic treatment of the subject as it is a brief overview, enough to give someone a good idea of the further reading they'd need to do if they were interested in a specific topic. Dr. Hahn has excellent insights, drawn primarily from the church fathers and the book of Revelation, about the theology, practice, and historical significance of the Mass through time; and it's origins as a divinely revealed institution, from christ to present day. His main thesis statement -- which again isn't new necessarily, but rephrased beautifully -- is that the Mass is literally heaven on earth, or as close as we'll get. Mass is the moment when God (in the form of his Son Jesus) comes down from heaven and dwells with us physically again. As such, Mass is the highest expression of the catholic Christian's life. Dr. Scott Hahn really gives a great insight into the connections between the Mass and the book of Revelation that helps understand that "Thy Kingdom Come" has already been inaugurated here on earth and is a 'foretaste' of the heavenly life. It's quite amazing to see how a Catholic convert connects the "elements of the Mass" to scripture in a powerful way that "cradle Catholics" might miss (maybe because of 'familiarity'). It can really awaken in us the understanding of how powerful the sacrifice Dr. Scott Hahn really gives a great insight into the connections between the Mass and the book of Revelation that helps understand that "Thy Kingdom Come" has already been inaugurated here on earth and is a 'foretaste' of the heavenly life. It's quite amazing to see how a Catholic convert connects the "elements of the Mass" to scripture in a powerful way that "cradle Catholics" might miss (maybe because of 'familiarity'). It can really awaken in us the understanding of how powerful the sacrifice of the Mass is to us when you realize that we are participating (in time) in the everlasting "celebration in heaven" with the angels and saints who participate with us! 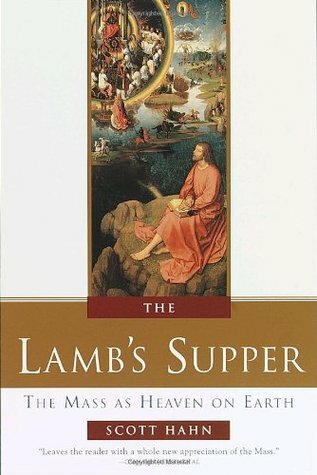 The Lamb's Supper is by scripture scholar Scott Hahn. Hahn was ordained as a Presbyterian minister and later converted to Catholicism. While still a minister he was studying Revelation in the Bible and studying what the Church Fathers wrote about it. Basically they said it was a liturgical manual. Hahn decided to go to a mass to see what he could learn. It was pivotal in his conversion. The basic thesis of the book is that Revelation talks about Heavenly worship. Through the mass we experience he The Lamb's Supper is by scripture scholar Scott Hahn. Hahn was ordained as a Presbyterian minister and later converted to Catholicism. While still a minister he was studying Revelation in the Bible and studying what the Church Fathers wrote about it. Basically they said it was a liturgical manual. Hahn decided to go to a mass to see what he could learn. It was pivotal in his conversion. I like it, although it was not what I was hoping for. Hahn does a good job of telling the slightly informed Catholic something about the glories of the depths of the liturgy of the Eucharist using the book of the Revelation to St. John as a framework and touchpoint. What he does not do, which I was hoping for, is explain the structure of that book as reflecting the outline of the liturgy. That's OK; I don't fault an author for writing the book he actually wrote rather than the one I wish he had. I like it, although it was not what I was hoping for. Hahn does a good job of telling the slightly informed Catholic something about the glories of the depths of the liturgy of the Eucharist using the book of the Revelation to St. John as a framework and touchpoint. What he does not do, which I was hoping for, is explain the structure of that book as reflecting the outline of the liturgy. That's OK; I don't fault an author for writing the book he actually wrote rather than the one I wish he had. In his easy to read and understand book, Scott Hahn teaches us how to enter heaven through the portal of the Mass. Using the Sacred Scriptures, especially the book of Revelations, he explains that this is the central purpose of the Mass. The opportunity for us to Worship God in heaven with all the angels and the saints is made available to anyone who has the eyes to see what is truly going on in every Catholic Church. This is a very scholarly yet approachable resource for understanding the many layers of the book of Revelation. We understand both the historical, futuristic and spiritual invoices which are speaking to the book of Revelation, we understand how the Catholic mass is living out the book of Revelation and we understand how every single aspect of the Catholic mass is firmly rooted in Scripture. I'm sure that I will re-read this book many times. It has helped me have new focus at mass. This book will transform the way that you look at and participate in Mass! It is a beautiful deep read about the Old Testament connecting to the way that we celebrate the paschal mystery each Sunday. I would recommed this book to any Catholic who doesn't get anything out of Mass but wants to understand their faith in a new way. Scott Hahn's take on the New Testament book of Revelation is far different from those who think it is about the end of the world. Instead he interprets it in relation to the Eucharist with some success. He used to be a protestant minister but converted to Byzantine Catholic. Regardless of your religion (or lack thereof), if you want to understand what the Mass is all about, read this! We read this in our bible study. Finally, an explanation on the book of Revelations that makes sense. Very good explanation and short foray into the theology behind Revelations! If you are looking for a book to help you get more out of Mass, this is the one. Scott Hahn details how the Mass connects perfectly with St John's account of heaven in the Book of Revelation. The result is deep insights in both directions: the hard to read Book of Revelation becomes significantly more intelligible, and most importantly, the Mass is seen as it really is, the intersection of heaven and earth. This should be a "must-read" for every Catholic. First time I read this I went through it quicker than I should have. This time I gave it more thought and appreciated it more. It explains in depth the symbolism of the mass and goes into each aspect of the mass and the transcendence that takes place during these aspects. Scott Hahn opens up the mass in a way that makes it easy for a layperson, like myself, to understand the deeper meanings of what is actually happening. At it’s heart is a love story, the eternal love story of Jesus being present to everyone, everyday, throughout time. Dr. Scott Hahn was born in 1957, and has been married to Kimberly since 1979. He and Kimberly have six children and are expecting their twelfth grandchild. An exceptionally popular speaker and teacher, Dr. Hahn has delivered numerous talks nationally and internationally on a wide variety of topics related to Scripture and the Catholic faith. Hundreds of these talks have been produced on audio and Dr. Scott Hahn was born in 1957, and has been married to Kimberly since 1979. He and Kimberly have six children and are expecting their twelfth grandchild. An exceptionally popular speaker and teacher, Dr. Hahn has delivered numerous talks nationally and internationally on a wide variety of topics related to Scripture and the Catholic faith. Hundreds of these talks have been produced on audio and videotapes by St. Joseph Communications. His talks have been effective in helping thousands of Protestants and fallen away Catholics to (re)embrace the Catholic faith. Dr. Hahn is also the bestselling author of numerous books including The Lamb's Supper , Reasons to Believe , and Rome Sweet Home (co-authored with his wife, Kimberly). Some of his newest books are Many Are Called , Hope for Hard Times , The Catholic Bible Dictionary , and Signs of Life .